Two longer cycles (90 TDs and 45 TDs) are down. Two shorter cycles (12 TDs and 23-24 TDs) are up into next week. 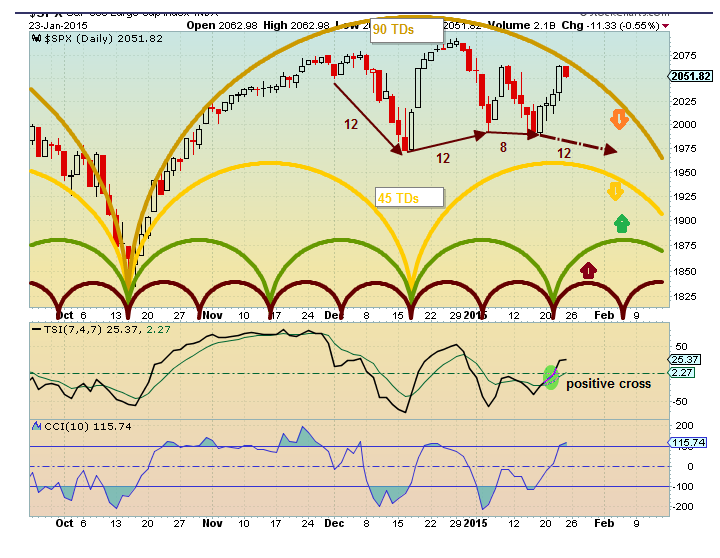 Expect top and turn down during the week with a bottom of short cycles by first Monday in February.... We may see new highs in SnP (close call?). On 4/15/2014 you wrote on your blog about the Jubilee, Kitchin Cycle, Blood moons and how it fits.........I came across this morning (0500 Hrs) and I might add I did not need any coffee, because this woke me up. How can I as a investor utilize this very valuable information. I grew up in Brunswick County NC (Bolivia) not far from you, am now living in Gulf Shores AL. A Jubilee here is when on the eastern shore in Mobile Bay, fish, crabs and shrimp swim to shore and the locals bring any kind of containers that will hold the seafood. It is a good thing for the locals (bad for the seafood). For shorter term swing trading it sets the likely environment of the market that you are trading in. If the trend changes to a seriously bearish market then you may want to trade some of the inverse ETFs (like RWM - inverse for Russell 2000 Index). There are inverses for most of the major indexes and many sectors (banks or oil). The direction of the market is less important than being in sync with the market direction. David Knox Barker wrote a book on Jubilee (it is covered in Leviticus in the Bible). Barker is from the Black Mountain NC area I believe and an expert on long term cycles. Google him for additional information. I looked David up and I read what he and others have wrote. This is a WHOLE another level, it is like playing three tiered chesse ( I have a problem playing just one board level). Anyway I trade in forex only, these inverses you are talking about are you talking is Greek to me. I buy and I sell a few times a week depending of the strength of the base currency. I do follow the overall market (Stock, DJ, S&P AND NOW THE Russell Index here in the US), as well as other countries Fed Reserve. I want to thank you for your time with answering my question. Next time I am in Bolivia (Mother) I'll send you a message to see if we could meet. I would love to pick brain your over some seafood, steak or ribs. I also have a place west of Charlotte about an hour from Ashville so not always at the beach.